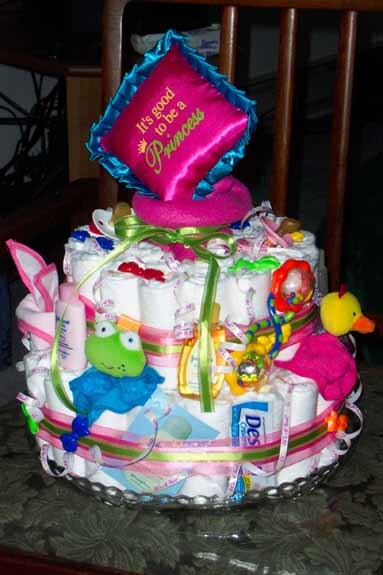 If I were receiving this gorgeous princess diaper cake at my baby shower, I would be beside myself! This baby girl cake is packed with toys, teethers, pacifiers, bibs, toys, lotions, creams, bottles, blankets and, of course, diapers!! This amazing cake was made and submitted by Andrea, one of our wonderful readers. She put so much creativity and effort into this cake and we are thrilled that she has shared her masterpiece! Andrea is helping to "pay it forward" by submitting her pictures to help the rest of us get ideas for our own baby cakes. We have the greatest readers in the world because they share their creativity to help make this website a better resource for all. Thank you SO MUCH Andrea!! I used a package of 60 diapers, size 1. 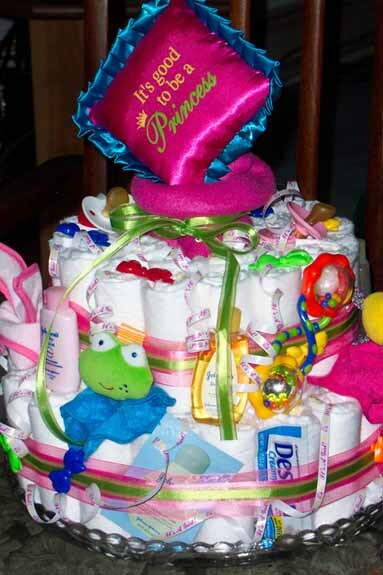 I used rubber bands to wrap each diaper and then large bands to hold the tiers together. I did need help to get the tiers together. I rolled a baby blanket and used it for the middle of the tiers. I wrapped ribbon around the cake to cover the rubber bands and used double stick tape to attach the goodies. I curled "It's a girl" ribbon and stuck them randomly in the diapers. Thanks Again Andrea!! The expectant mother is very lucky to receive such a fabulous cake!